Meet a remarkable young man. Max doesn't communicate like we do. But he communicates better than we do about the most important things. Max doesn't think like we do. But his actions reflect deep spiritual truths. With candor and wit, Emily Colson shares about her personal battles and heartbreak when, as a suddenly single mother, she discovers her only child has autism. Emily illuminates the page with imagery---making you laugh, making you cry, inspiring you to face your own challenges. Chuck Colson, in his most personal writing since Born Again, speaks as a father and grandfather. It is a tender side Max brings out of his grandfather, a side some haven't seen. 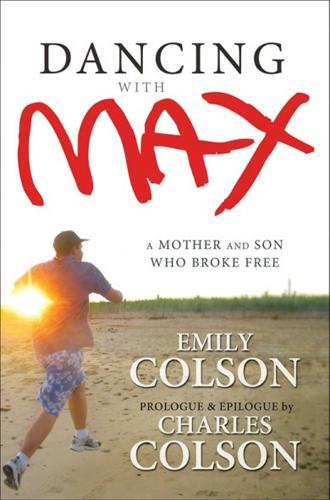 As Emily recalls her experiences, we discover that Max's disability does not so much define who he is, but reveals who we are. Dancing with Max is not a fairy tale with a magical ending. It's a real life story of grace and second chances and fresh starts in spite of life's hardest problems. And Max? Max will make you fall in love with life all over again, leaving you dancing with joy.